The aviation world was rocked by news of the passing of Serge Dassault, a visionary pioneer and billionaire industrialist. Age had not held one of France’s richest men back; Dassault died in his office on the Champs-Elysees at his desk on the 28th May, aged 93. SERGE Dassault was an aerospace magnate, arms industrialist, newspaper publisher, and one of France’s richest men. 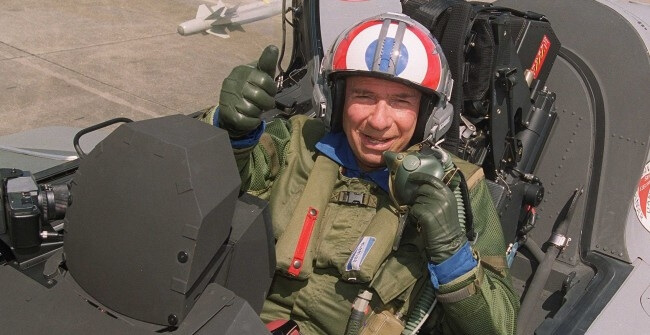 He was especially known for the development of France’s Mirage jet fighters, as well as for equipping the French Air Force and other governments and militaries through global sales. He was chairman and CEO of the Dassault Group when he died, and president of honor of Dassault Aviation, which he once led. He was born Serge Bloch in Paris on April 4 1925, the second son of Marcel Bloch, who had founded his first aircraft company in 1928. During the Second World War, the family was held in internment. After the war, Marcel Bloch began to rebuild his business and changed the family name to Dassault. Serge was educated at the Lycée Janson de Sailly, Paris, and the Ecole Nationale Superieure de l’Aeronautique, before joining the family business in the 1950s. It wasn't until his father's death in 1986 though that he was finally able to take over. The office of President Emmanuel Macron praised a man who, he said, had consecrated his life to developing a flagship of French industry. Survivors include his wife, Nicole, their daughter and three sons. The oldest son, Olivier, is a deputy in the national assembly. Dassault Aviation's 100 year anniversary video showcasing the Falcon 8X, the Rafale and the renowned French Air Force's Patrouille de France which took to the skies in a thrilling celebration of a century committed to pushing the envelope. Charter a Dassault private jet from superFLY for your next flight. We have various Falcon's on our fleet positioned throughout the globe. Contact us for a competitive quote or click here to submit a flight/quote request.